Students will evaluate the experiences and contributions of diverse groups to multicultural societies. Students will generate summaries, generalizations, and thesis statements supported by evidence. Students will read and discuss immigrant stories from varying time periods, after viewing an iMovie incorporating text from The Star Spangled Banner in different languages and photographs. Students will also explain the necessity of translating our national anthem into many different languages. After reading and highlighting the text of their Immigrant Voices stories, students will participate in a Socratic Seminar to discuss with one another, then they will write two to three paragraphs reflecting on what they have learned about the experiences of other cultures regarding The Star Spangled Banner and other patriotic poetry. Present iMovie “The Star Spangled Banner in Multicultural Societies” to students. 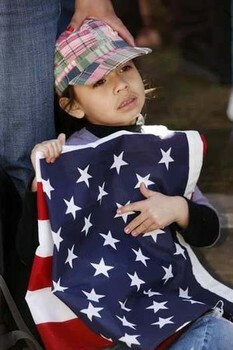 Ask students to jot down ways the American flag is used in the different photos, and briefly discuss in class. Pass out copies of Immigrant Voices Stories to students. (These stories can be found at the Angel Island Immigrant Station Foundation website as well as the PDFs attached.) Ask students to read, highlight and annotate their Immigrant Voices Stories to prepare for a Socratic Seminar discussion about the experiences of these immigrants in our multicultural American society. What kinds of experiences did your immigrants have in their stories? What do you think your immigrant would have to say about our national anthem The Star Spangled Banner? Why? Does The Star Spangled Banner hold the same meaning for all Americans? Why or why not? Is it okay for the national anthem of the United States of America to be translated into languages other than English, like Spanish, French, German, Italian, etc.? Why or why not? What does The Star Spangled Banner mean to you? Betsy Blount teaches ninth grade World Geography in San Antonio, Texas at Tom C. Clark High School (http://nisd.net/clark/). This entry was posted in Arrangements, Banner Moments, Cultural Diversity, Education, The Anthem, Translations and tagged angel island, culture, immigrant, language, multicultural. Bookmark the permalink.